We investigate the Northern Hemisphere atmospheric circulation anomalies associated to the sea surface temperature (SST) anomalies that are related to the eastern-Pacific and central-Pacific El Nino-Southern Oscillations in the late autumn (November). This research is motivated by the need for improving understanding of the autumn climate conditions which can impact on winter climate, as well as the relative lack of study on the boreal autumn climate processes compared to winter. Using reanalysis and SST datasets available from the late nineteenth century through the recent years, we found that there are two major atmospheric responses; one is a hemispheric-wide wave number-4 pattern, another has a more annular pattern. Both of these project on the East Atlantic pattern (southward-shifted North Atlantic Oscillation) in the Atlantic sector. Which of the patterns is active is suggested to depend on the background mean flow, with the annular anomaly active in the most recent decades, while the wave-4 pattern in the decades before. This switch is associated with a change of correlation sign in the North Pacific. We discuss the robustness of this finding. 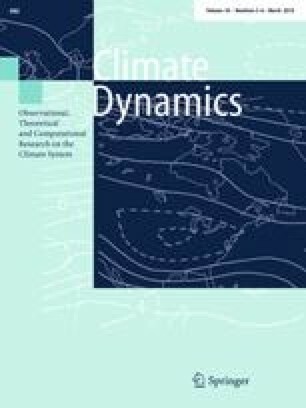 The ability of two atmospheric general circulation models (ICTP-AGCM and ECHAM-AGCM) to reproduce the teleconnections is also examined. Evidence provided shows that the wave-4 pattern and the East Atlantic pattern signals can be reproduced by the models, while the shift from this to an annular response for the recent years is not found conclusively. The online version of this article (doi: 10.1007/s00382-017-3727-5) contains supplementary material, which is available to authorized users. We thank I. Bladé and B. Rodriguez-Fonseca for beneficial discussion. Comments and suggestions from the reviewers have helped to improve this study. We acknowledge the NOAA-CIRES twentieth Century Reanalysis V2, UK Met Office HadISST, NCEP-NCAR Reanalysis, and the Japanese 55-year Reanalysis for the data used in this study. This study is supported partly by the Research Council of Norway’s KLIMAFORSK program (Project No. 255027). The work of Ivana Herceg-Bulić has been supported in part by the Croatian Science Foundation under project 2831.